The easiest chhappathi ki sabji,which even children like to have with chhappathi or puri,is given here. Place a pan on the stove ,add oil to it. After heating,add mustard seeds and jeera,after spluttering add red and green chilli pieces ,curry leaves , then onion pieces ,lastly aloo pieces,saute it . Now add water(1 cup),let it cook for 5 mins. Then after 5 mins, add water (2 cups) to 1/2 cup besan powder,and mix well. 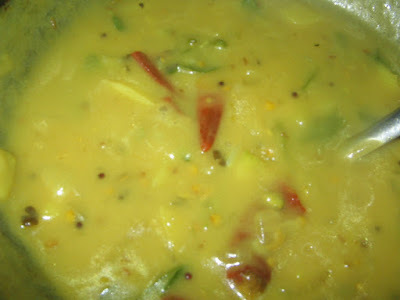 Ilike the consistancy of the curry to be soft and loosen thats why i add 2 cups. Then add the besan water to the aloo mixture and cook in low flame. See that the bottom of the curry wont turn black,stir it for every 3 mins. Like wise cook till the aloo piece is cooked.Lastly add salt.Transfer in to a serving bowl,and serve hot with rotis,phulkas or puris. Children and even elders like this as it is not spicy,and it is soft. Chakkati combination roti ki.Chala rojulayindhi e kura thini..
thats a nice curry! besan n aloo combo is new to me. Thank u all for your sweet comments which are rechargers for me..